Image Title: God, so many togs are everywhere around and I forgot my credit card ! Oh, this one is terrific. 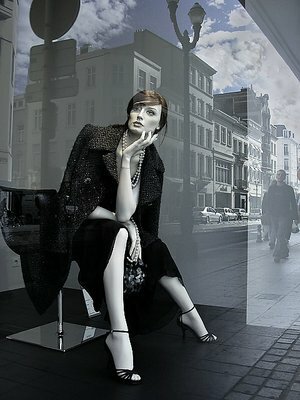 Very nice composition between the street reflection and the subject manikin. Your geometry worked out perfectly. Wow I like this. First drawn to the figure and love the pose then notice the building and people in the reflection which are equaly interesting. Nice work. excellent composition & wonderful mirror image & wonderful tonality. Without the people showing up on the street it would be flawless. perfect reflections. seems she?s out in the steet.